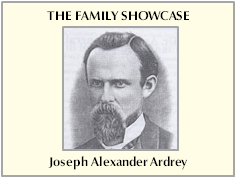 Family Books / Alexander / Alex Alexander kin, Volume II Alexander, Charles C. and Virginia W.
Family Books / Ford / Stor Ancestors: The story of the Ford and related families Ford, Russell W., Jr.
Family Books / Barrow / Barr Barrow family of Virginia, 1620-1972 North, Mae B. Family Books / Belk / Belk Belk, Inc: the company and the family that built it Covington, Howard E., Jr.
Family Books / Bennett / Benn Bennett family group sheets: Bennett, Godshall, Rogers, Thornton, Kingsmore, Young, Webb, Washington, and Meece Humphries, Thomas G., Jr.
Family Books / Bizzell / Bizz Bizzell family Bizzell, Oscar M. and Virginia L.
Family Books / Bolton / Bolt Bolton, some history and events Bolton, James H.
Family Books / Littlejohn / Came Cameron Littlejohn genealogy McConnell, Thomas R., Jr.
Family Books / Roddens / Carr Carry me back … The Story of the Roddens, Rawdens, Rodens and allied families Rodden, Paul G.
Family Books / Springsteen / Casp Caspar Springsteen’s family; their amazing migration from the Netherlands to New Amsterdam then North Carolina Springs, Winborne F.
Family Books / Smith / Clan Clan Smith Society, Inc. (U.S. Branch) Smith, Emery, Jr.
Family Books / Collins - Ritch / Coll Collins - Ritch papers Collins, James Perry, Sr.
Family Books / Ferguson / Desc Descendants of James and Elizabeth Fleming Ferguson, Bedford County (now Marshall), Tennessee Ferguson, Herman W.
Family Books / Means / Desc Descendents of William Means of Christian Co. KY Means, David, Rev. Family Books / Dunlap / Dunl Dunlaps of Moore County, NC Copeland, John W.
Family Books / Lay / Earl Early Carolina Lays, main lines, spur lines & zig-zags … with a long trestle to Adams. Lay, Robert C.
Family Books / Hilliard / Fami Family of Ezekiel Hilliard of Chatham County, NC, 1801-1992 Cheek, Flossie H.
Family Books / Dodson / Gene Genealogy of the Dodson (Dotson), Lucas, Pyles, Rochester, and allied families Lucas, S. Emmett, Jr.
Family Books / Lemmond / Gene Genealogy of the Lemmond family Lemmond, Charles Q. Family Books / Lemmond / Gold Gold rush letters from William Lemmond, a 49er from Carolina Stokes, Allen H., Jr.
Family Books / Helms / Helm Helms Descendants 1720 - 1991 Helms, Gerald C. and Sara Myers and William E. Helms, Jr.